Is there evidence of the Conquest at Ai? The following article is based on Dr. Aardsma's book A New Approach to the Chronology of Biblical History from Abraham to Samuel. A more thorough discussion can be found there. Ai was the second city Joshua's army attacked during the Conquest. The ruins of this city are a mound known to archaeology as et-Tell. A few individuals have questioned this identification, motivated by the fact that the archaeology at et-Tell at the traditional date for the Conquest does not fit the biblical account of the Conquest at all. However, the geography and topography of et-Tell closely match the biblical description of Ai. The Bible records in Joshua chapter 8 that the Israelites defeated Ai, killed its 12,000 inhabitants, and burned the city. This event would leave a clear destruction layer. Dr. Aardsma's chronology places the Conquest ca. 2400 B.C., a full thousand years earlier than the traditional date of the Conquest. Does the archaeology at et-Tell at 2400 B.C. fit the biblical account of the Conquest? In the figure above, the solid horizontal lines represent periods of time during which Ai was an unwalled town. The rectangle represents time during which Ai was a walled city. The letters A and B mark the conventional (early and late) dates for the Conquest. The letter C marks the date of the Conquest according to Dr. Aardsma's biblical chronology. This summary of Ai's history clearly contradicts the idea that the Conquest happened ca. 1400 B.C., the traditional date. It is not hard to see why Ai has been a problem for traditional biblical chronology. The city was uninhabited for 1,000 years prior to ca. 1400 B.C., when traditional biblical chronology says Joshua destroyed the city. On the contrary, the archaeology from et-Tell fits very well with the Bible's account at Aardsma's date of 2400 B.C. The discovery of the sanctuary was the unexpected result of a long and difficult labor. Situated to the South-West of the palace, on a less elevated piece of ground, the site completely disappeared beneath a 6 meter [over 19 feet] high heap of stones, covering a more or less circular area of about 20 ares [.5 acre]. This heap made me think of a tower dominating the view to the South-West. This heap of stones is a most exciting and persuasive piece of evidence. 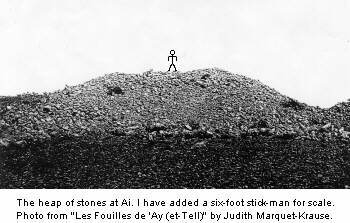 There is clear archaeological evidence from et-Tell of the biblical Conquest at Ai. 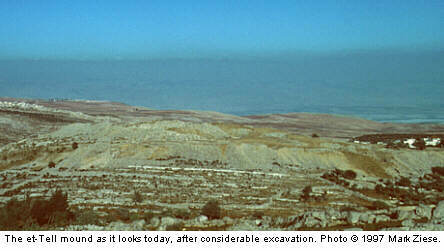 The evidence was not recognized by the original excavators, however, because the traditional biblical chronology upon which they were relying misdated the Conquest by a full millennium. The foregoing article was based on Dr. Aardsma's book A New Approach to the Chronology of Biblical History from Abraham to Samuel. A more thorough discussion can be found there.